Born: 20 September 1793, Cape Town, South Africa. Died: 17 December 1829, Rotterdam, Netherlands. Johannes K. van Oosterzee, son of Willem Johan van Oosterzee, an official of the Dutch East India Company, grew up in Cape Town. 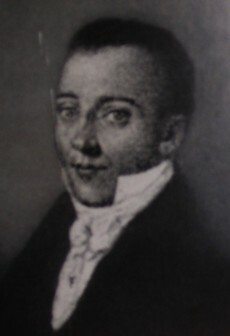 In 1809 he was sent to the Netherlands to study, qualifying as Doctor of Medicine (MD) at the University of Leiden in 1817 with a thesis entitled Dissertatio physiologico-medica, de femina.... After his return in 1818 he became one of the first locally born medical men to practice (as medical doctor and accoucheur) at the Cape. He has furthermore been described as the most competent and most celebrated Cape Town doctor of his time. His interest in the use of natural hot springs to treat rheumatism led him to write a paper on "Het warmbad op Caledon" (The warm bath at Caledon) in the early eighteen-twenties, but as far as is known no copies have survived. With Drs J.H.F.C.L. Wehr* and R. Heurtley, he reported on a case of rabies in a girl of about 11 who had been bitten by a dog, in the South African Commercial Advertiser of 19 August 1826. This seems to have been only the second known case of rabies in South Africa, the first having occurred in 1821. Van Oosterzee was a member of the South African Medical Society, the first of its kind in southern Africa, which was established at some time before June 1827 and remained active for about twenty years. Papers were regularly delivered by members and on 6 August 1827 a committee consisting of Drs Van Oosterzee, R. Heurtley, and C.L. Liesching* was appointed to arrange for their publication; however, no copies of any such publications appear to have survived. Van Oosterzee was first listed in the directory of the African court calendar in 1819, when he resided with his widowed mother at 6 Mostert Street. By 1824 he resided at Garden Buitenzorg, but from 1826 he practiced at 1 Church Square, where he also had a store. In 1828 he applied for a seat on the Medical Board. However, around this time his health failed. He then took his family to the Netherlands, where he died. On 29 August 1819 he married Augusta W.M. Thalman. In 1832 his widow married his former friend, Francois L.C. Biccard*, who was studying in the Netherlands at the time, and returned to the Cape with her new husband. African court calendar and directory/South African almanac and directory, 1819-1829. Reprinted by SA Library, Cape Town, 1982. Beck, J.H.M. History of medicine and medical practice at the Cape (1894). In British Medical Association, Cape of Good Hope (Western Province) Branch, Presidential addresses for the years 1888-1908 (pp. 63-111). Cape Town: Taylor & Snashall, 1908. Blumberg, C. The South African Medical Society, 1827-1846. South African Medical Journal, 17 August 1985, Vol. 68(4), pp. 267-269. National Automated Archival Information Retrieval System (NAAIRS). . Documents relating to Van Oosterzee, Johannes Knocker(s) / Dr Van Oosterzee. South African bibliography to the year 1925, Vol. 5. Cape Town: SA Library, 1991.